During the French regime in Canada the need for higher denominations of currency was filled by paper money. The lowest denomination of this paper money, however, was 7 sols 6 deniers. There remained, therefore, a need for low-denomination coins for making change and for small transactions. 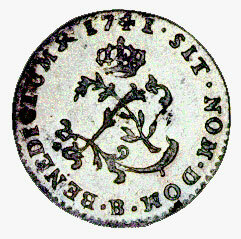 The most widely used coins were those made of billon (low-grade silver), of which the most important was the sou marque of the type illustrated. These coins, struck between 1738 and 1764, circulated in France and her colonies and, prior to 1760, large shipments of them were sent to New France (Canada). The denomination was 2 sols (24 deniers). The sous marques were not very popular, due to their low silver content. Once in circulation they tended to turn black and for that reason gained the nickname "black dogs" in the French colonies of the West Indies. However they continued to circulate in Canada for some time after the British conquest, because of the continuing shortage of small change. This coin is part of the Bank of Canada's National Currency Collection.